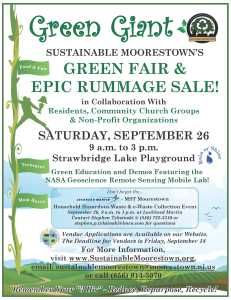 As one of its first acts as a permanent committee, Sustainable Moorestown’s Green Team is hosting a green fair and rummage sale called the Green Giant in collaboration with residents, community church groups and non-profit organizations. The Green Giant, Green Fair and Epic Rummage Sale will take place on Saturday, Sept. 26 from 9 a.m. to 3 p.m. at the Strawbridge Lake Playground, on South Church Street and Haines Drive. The fair will have green education and demos, featuring the NASA Geoscience Remote Sensing Mobile Lab. The rummage sale will be local vendors selling used or repurposed items, all in the name of sustainability. Sustainable Moorestown’s Green Team has been talking about hosting this Green Giant for months before it was named a permanent committee in town in early August. As part of its commitment to the Sustainable Jersey program, sustainable teams must complete certain actions that award the community points for completing each task, a green fair being one of them. The Green Team has helped Moorestown achieve a Silver level, the highest level of the Sustainable Jersey program. Out of the 428 communities participating in Sustainable Jersey, there are only 28 at the Silver level. 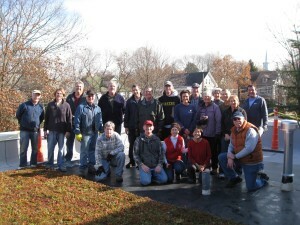 The team achieved this level in many ways, including a “Green Roof” on the new municipal building designed to capture stormwater and reduce its flow and reducing temperature extremes on that portion of the building; managing the bio-retention basin in front of the new library as a monarch way station, in cooperation with STEM; and installing hiking signs throughout the township to promote use of open spaces. Having the Green Giant event helps to keep Moorestown at the Silver level. However, Sustainable Moorestown’s Green Team couldn’t take all of the credit. “Community groups and non-profits in town do a lot of things in Moorestown. Here, they can show how what they do ties into environmental or sustainability concepts, let people know what is going on; and there is a lot going on,” communication volunteer Candace Coleman said. The Green Fair will have information on a number of new hybrid vehicles and electric powered vehicles; what’s appropriate to recycle and what’s not; and information on quite a number of township committees and non-profits. Perkins Center for the Arts will participate in the event with a Pottery Seconds Sale. The Moorestown Police Department will conduct bike and car-seat safety demos. Holman Automotive will bring a fleet of new hybrid and electric cars to display (BMW, Ford) and there will be a privately owned Tesla for people to see. MoorArts is doing a repurposed craft activity for kids. The Moorestown Tree Committee will have displays. There will be a solar power display and huge Burlington County recycling display to show people what they can and can’t recycle. “We will have a comprehensive display of items that should be recycled and those that should not,” Skacel said. Also scheduled for the Green Fair is Palmyra Cove’s newly acquired NASA Geoscience Remote Sensing Mobile Lab, which will provide “hands-on” demonstrations of solar and wind energy as well as remote sensing, satellites and computer visualizations. “It is a wonderful thing, especially for kids, to see,” Coleman said. “The rummage sale is the ultimate way to repurpose things. It is the best way to keep things out of landfills. It’s a way that anyone can be green. You don’t need an environmental background. This is making it so someone else can use it and give it a new life somewhere else,” Coleman said. Food vendors, vendors with a focus on sustainability, residents, churches and non-profit organizations are invited to participate. Items for sale at the rummage sale are limited to used and repurposed items. 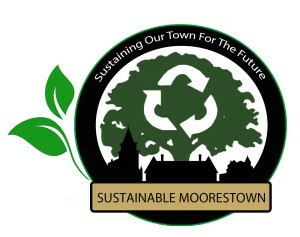 Vendor applications are available at www.sustainablemoorestown.org. Submit registrations to sustainablemoorestown@moorestown.nj.us, or register with one of the area churches participating in the event. The deadline for vendors is Friday, Sept. 18. “I hope that residents walk away with a better understanding of the concept of sustainability and how each person, township committee, area churches and non-profits contribute toward ensuring that Moorestown remains a vibrant and engaged community. And most importantly, that they have a good time,” Skacel said. Lockheed Martin will also host a Hazardous Waste Disposal event at 199 Borton Landing Road, Moorestown, from 9 a.m. to 1 p.m. the same day. For more information, visit www.SustainableMoorestown.org, email sustainablemoorestown@ moorestown.nj.us or call (856) 914–3070. “We enjoy our way of life in Moorestown. If we want to ensure that that way of life continues, it’s imperative that every citizen get involved in some facet of sustaining it,” Skacel said.